Since then, billions have been poured into poorly conceived so-called “Islamization” projects with very little measurable success; Gulf money poured into Islamic Study Centres with very little community credibility and Traditional centres of learning already decimated by colonialism, continued in their outdated and reclusive manner without any accountability to the community it served. Previous attempts at so-called Muslim colleges/institutes in the West have either been ‘one-man shows’ with dubious funding sources or completely out of touch & irrelevant study programs. Over the course of years til today, from local evening or weekend Islamic classes, to fully fledged Islamic Schools to Universities, the same old questions are being asked again and there is still no clear methodology, philosophy, theology and pedagogy for the practice and standard of modern Islamic education. Hence, in many Muslim majority countries, the constant struggle between secularism, modernity and religion and thus in entail affects, Muslim minorities in the West, who despite all the freedoms and resources, & those in power choose to continuously take these failed models and perpetuate the problems even more, thus Islamic education fails to be the transformative factor in their local communities. The main focus of the seminar is to develop a transformative narrative on philosophy, theology and pedagogy for the practice of modern Islamic education. 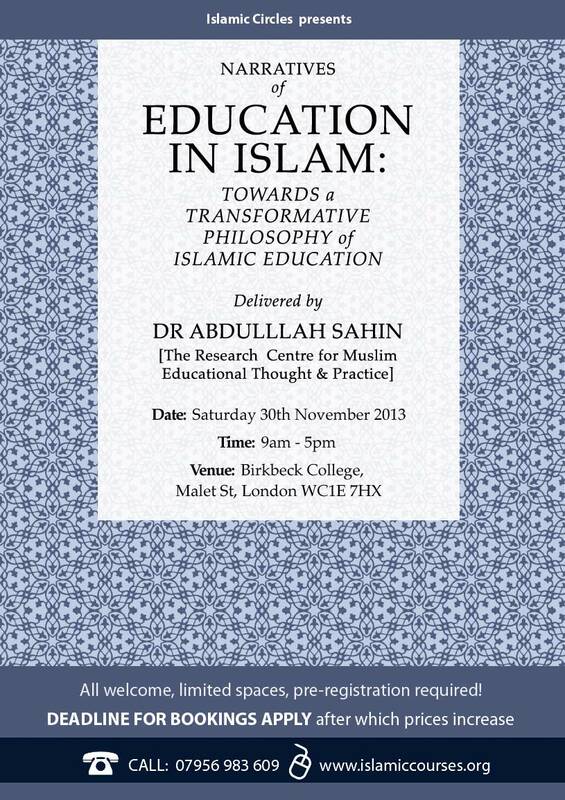 The seminar will be based on the Third Section (Theology, Philosophy & Pedagogy/Chapters 7-9) of the Book by Sahin (New Directions in Islamic Education; pedagogy and Identity Formation, Kube, 2013). The day seminar will start with a brief critical assessment of the models and interpretations of education in Islam that have come to dominate the contemporary practice of Islamic education. 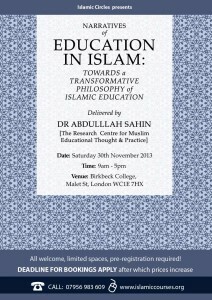 The discussion will lead to highlight the importance of rethinking the philosophical, theological and pedagogic foundations of current perceptions of Islamic education some which have been put into an institutional framework. The rethinking process will be grounded within the original sources of Islam, the Qur’an and Sunna as well as the subsequent emergence of the creative pedagogic impulse within the Muslim tradition. During the seminar there will be an opportunity to explore the basic concepts within contemporary philosophical and pedagogic discussions in the field of Education Studies. Participants are also encouraged to look at the foundational sources such as the Qur’an and Hadith texts and their classical commentaries mentioned in the book. Nasr, S.H (1989) knowledge and the Sacred, Newy York. Bloom, B. S, (ed), et al. (1969). Taxonomy of educational objectives: The classification of educational goals.New York: McKay. Dewey, J (1997) Experience and Education, Touchstone, New York. Freire, F (2006), Pedagogy of the Oppressed, Continuum, London. Kanpol, B (1999) Critical Pedagogy: An Introduction, Bergin & Garvey, London. Hall, S and Gieben, B (eds) (1995) Formations of Modernity, The Open University, London. Habermas, J (1987) Knowledge and Human Interest, Polity, Cambridge.